Siena is such an incredible city. Not only is it surrounded by some of Tuscany's most beautiful countryside, it retains its medieval look and feel. Visiting Siena is like stepping back in time. The city is well worth a day trip and easily reach via bus from Florence. So I have rounded up my 10 must-do things in Siena. 1) Marvel at the marble-striped duomo. 2) Climb the unfinished wall of the church for the perfect panoramic of Siena. 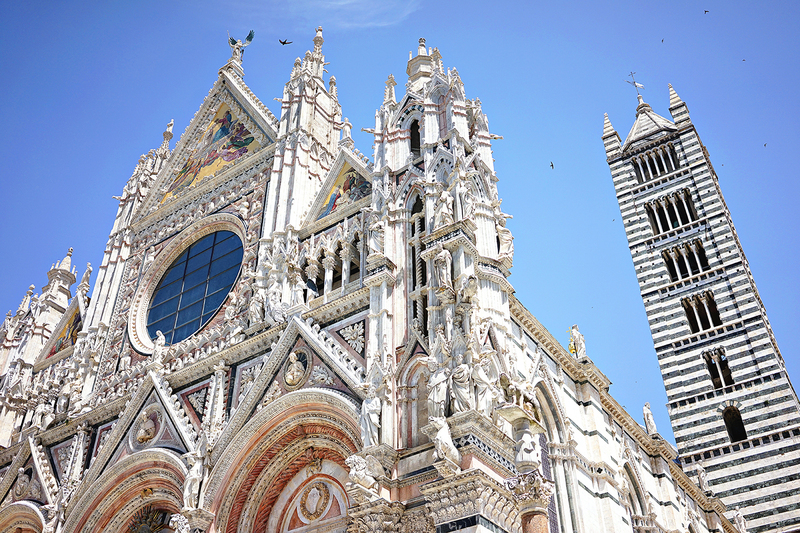 Although unfinished, today Siena's unrealized cathedral houses the duomo museum. But the best part of this awkward wall is that you can climb it. From the top you can see the perfect view of Siena's famous Campo (main town square, pictured above). 3) See the Piccolomini Library. Inside Siena's massive cathedral, in a small room on the lefthand side of the nave, is the Piccolomini Library. In my opinion, it is one of the most beautiful cycle of Renaissance-style frescos in the world. 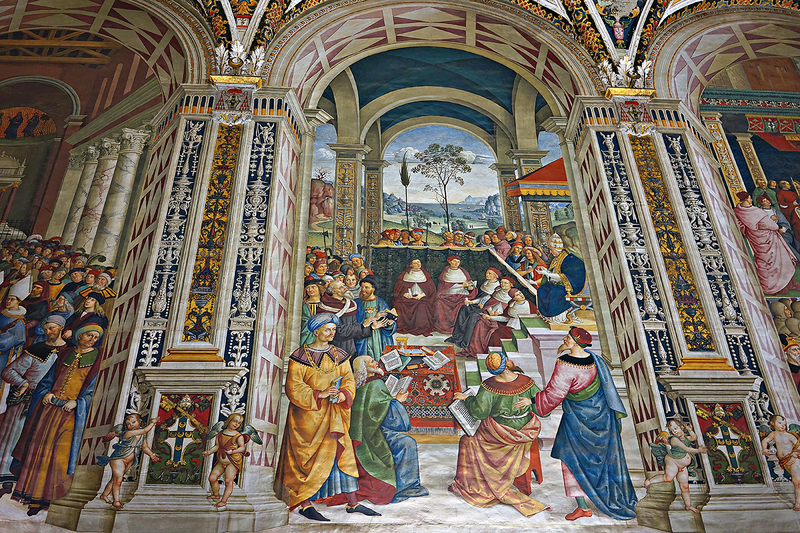 The library was built by Siena's most powerful family, the Piccolomini (the family produced two popes). The library was intended to hold the manuscript collection of Pope Pius III (then just the "nephew" of Pope Pius II). The gorgeous and colorful fresco cycle was painted by Pinturrichio and his assistants, which included a young Raphael. 4) Visit the city's archive. I know I am very partial to archives, but I promise visiting the Sienese archive is a very cool experience. They have created a little museum inside of the archive to display the city's rich history. It is a quick but very interesting visit. Like most regions in Italy, Siena has a couple of interesting local food specialities. The most famous is probably panforte. This fruit and nut concoction dates all the way back to the 13th century. The word literally means strong bread and it was created as a durable (and spicy) snack for long journeys. It was even the snack of choice for many crusaders. Think of it as an early Lärabar. 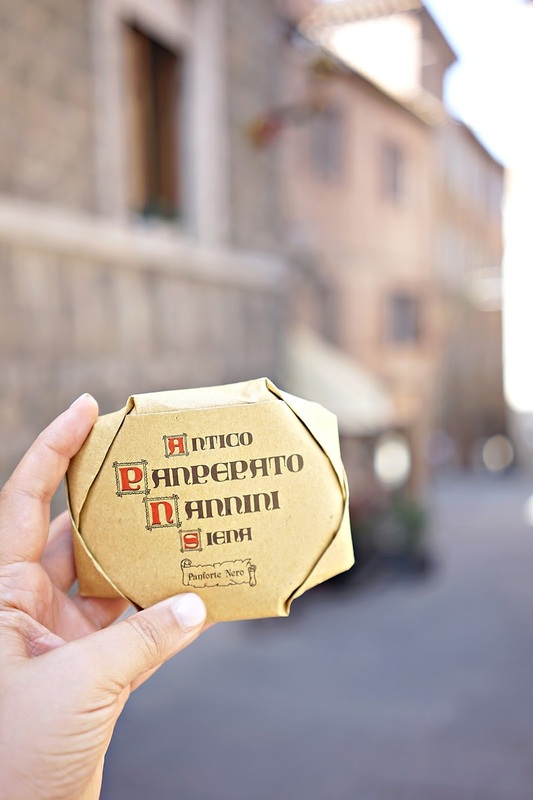 Today, all sorts of variations are sold in shops throughout Siena. 6) Learn about the Palio in the Campo. You will definitely want to visit the main square of Siena, which is famous for two reasons -- its odd shape (like a shell) and the historic horse race that still occurs there. The Palio is a crazy horse race that has been run since the 14th century. Many of the restaurants around the square display pictures of this unbelievable event. Siena is divided into 17 rival neighborhoods, or "contrade." While the competition today is peaceful, historically these divisions were fierce rivalries. Each contrade in Siena has their own church, baptismal font, festivals, and identity. They also have their own racehorse, and this is where the competitors for the yearly horse race come from. In addition to a crazy horse race, Siena is also famous for a very important woman - Saint Catherine of Siena. Although she died in Rome, Catherine was born and lived much of her life in Siena. Today you can visit her home and her relics (a finger and head) inside the church of San Domenico. Catherine is remarkable for the political role that she played in the 14th century. This was obviously not a period when women had formal rights or political power. Catherine, however, managed to eschew marriage and played a critical role in reestablishing the papacy in Rome. She also famously didn't eat anything but the holy eucharist. Mystical women, like Catherine, are the subject of one of my all-time favorite books - Holy Feast, Holy Fast. 9) Stroll and shop Siena's picturesque streets. Siena isn't all history and no fun. The city has great shopping and cute streets, which are perfect for window (and non-window) shopping. 10) Sip some bubbles (or coffee) in the Campo. After a long day of exploring and sightseeing, Siena's main square (or Campo) is the perfect spot to sit and admire the city's beauty, people watch, and enjoy a drink. You will pay extra for the location, but it's totally worth it! Have you visited Siena? 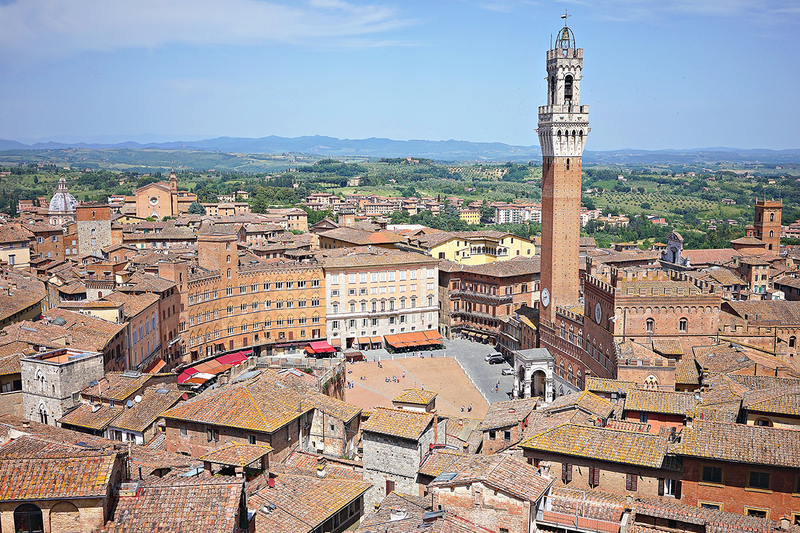 What are your must-do in Siena?